Actually, about 6 months ago, I stopped using my personal Snapchat. 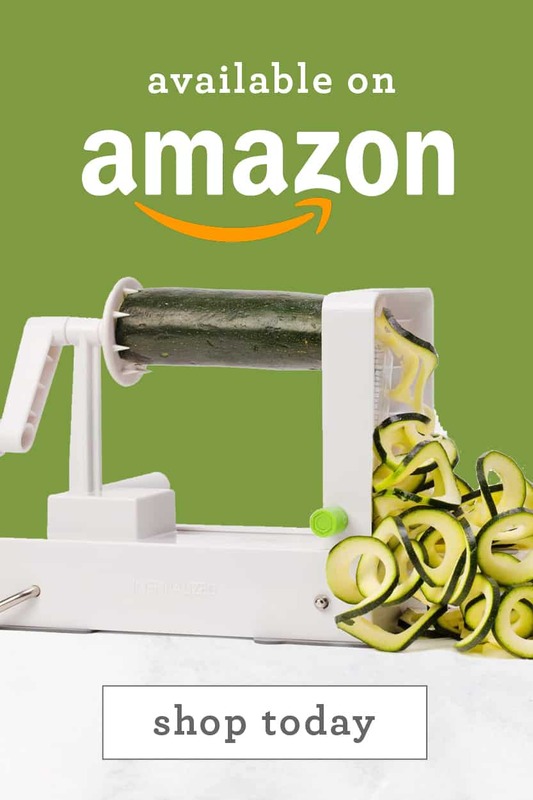 Of course, now that it’s for Inspiralized, I already researched all of the fun things you can do with the App, and now, I’m having a lot of fun. On Friday night, I actually cooked my entire recipe (the Bikini Bolognese from my cookbook) on Snapchat. 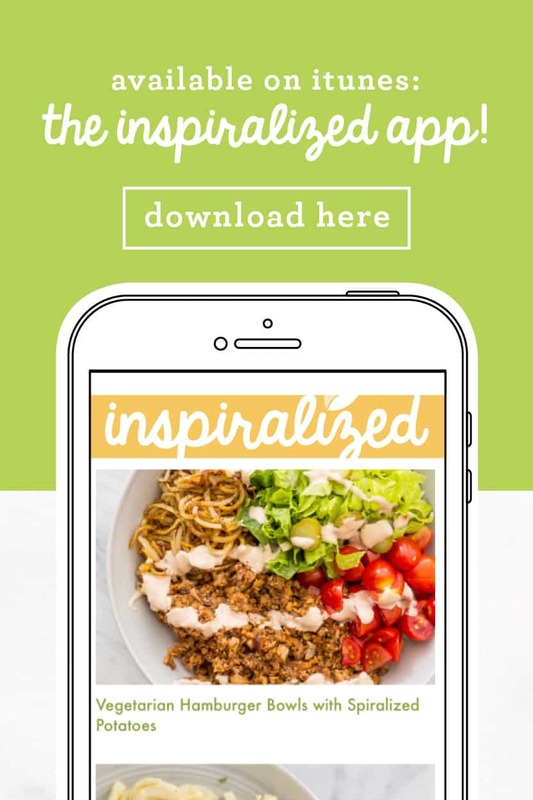 When I saw people were actually watching the Snaps and sending me Snaps, I realized it was a good social media channel for Inspiralized. 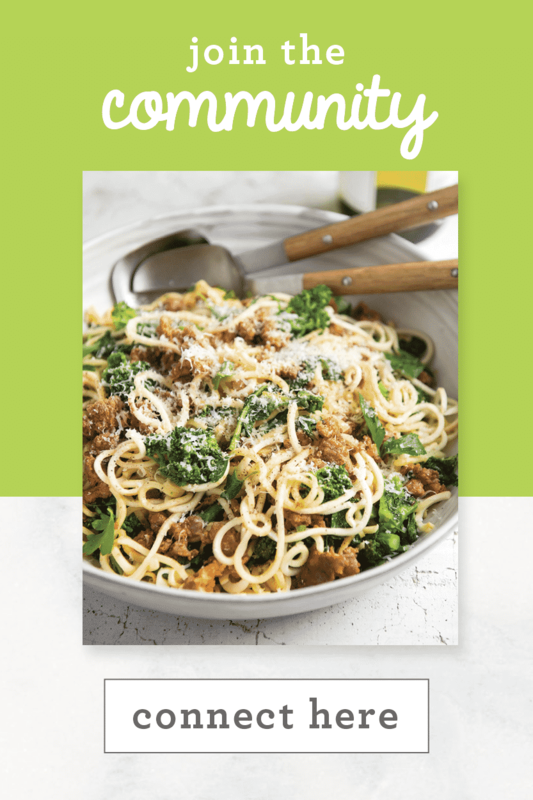 Most importantly, I’ll be leaking my big announcement for Tuesday (and it’s not the cookbook!) I seriously can’t wait for this week. On Friday, Lu brought home March’s issue of Shape Magazine, which features Kate Hudson on the cover. 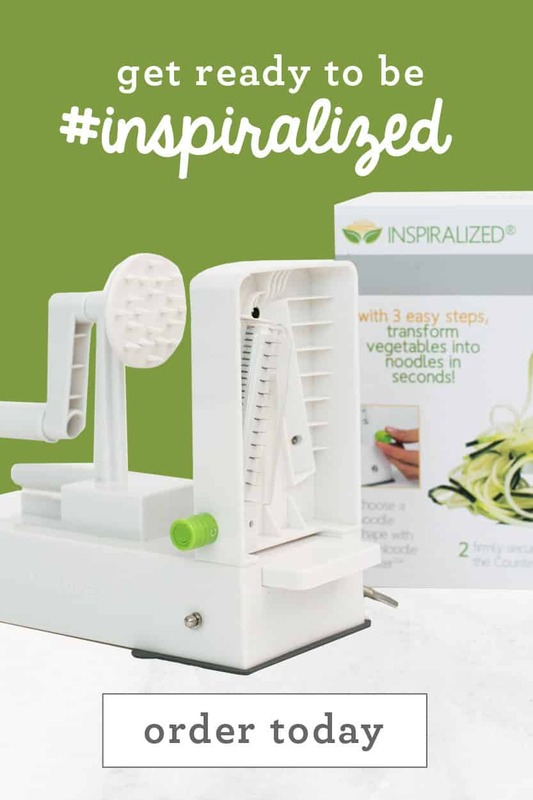 Inside, on page 18 to be exact, there’s an insert about the Inspiralized cookbook! 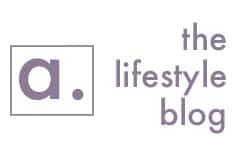 That obviously started my excitement for this week – I can’t believe I’m featured in Shape! I’ve been reading that magazine since, well, I realized I was a girl, and have been a fan ever since – and now, I’m in it! 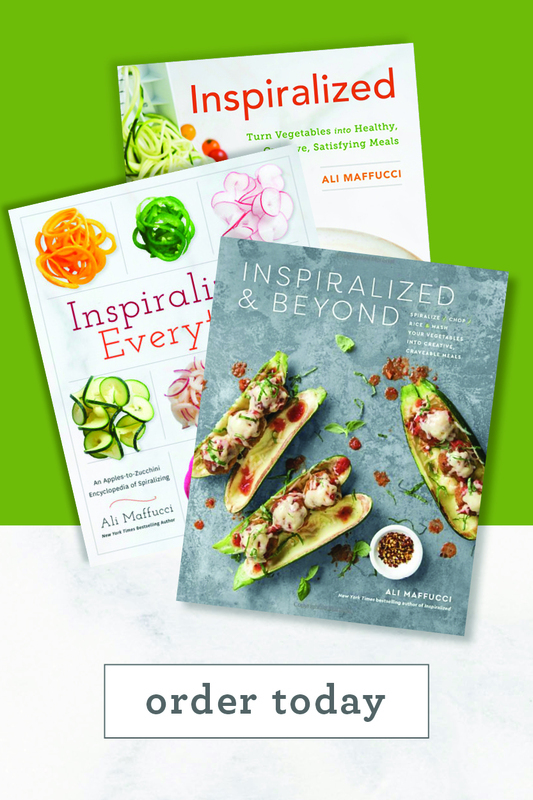 If you haven’t pre-ordered your cookbook yet, please do. Actually, it’s on crazy sale right now on Amazon, because we’re only two days away from on-sale (it’s $12.22 right now, down from $19.99!) 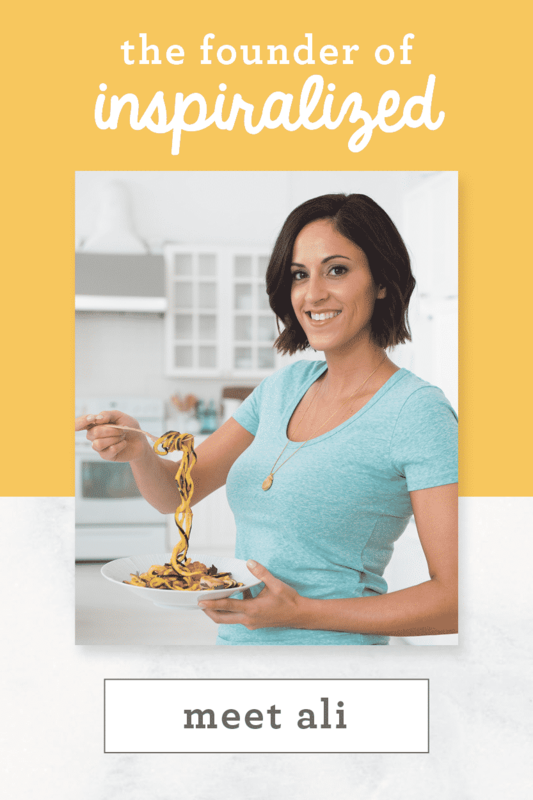 And remember, if you pre-order it anywhere, make sure to enter your purchase order information into this form to receive the Bonus Pack, which includes 4 sneak peek recipes from the cookbook, 4 brand new recipes and a month of weekly meal plans and shopping lists! Now, for this recipe. 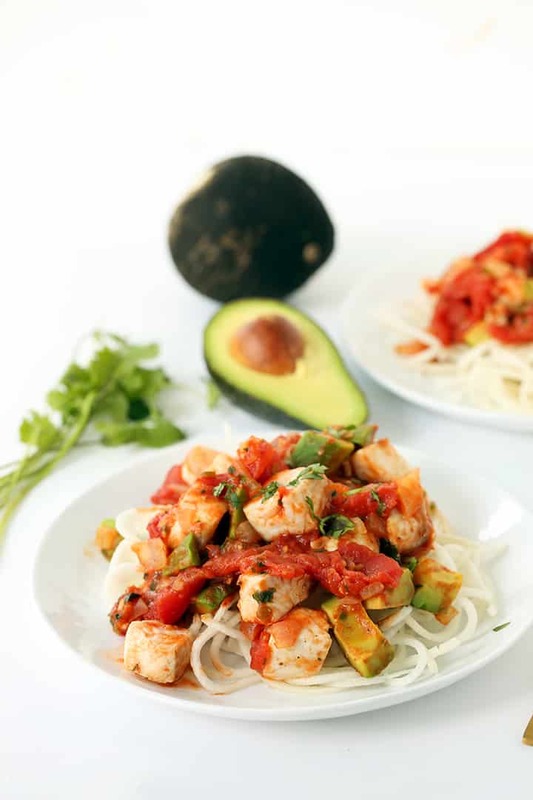 I mean, who wouldn’t want avocado in their tomato sauce? ‘nough said, right? I buy tilapia every couple of weeks to make fish taco salads (or blacken it and put it over some spiralized rice.) 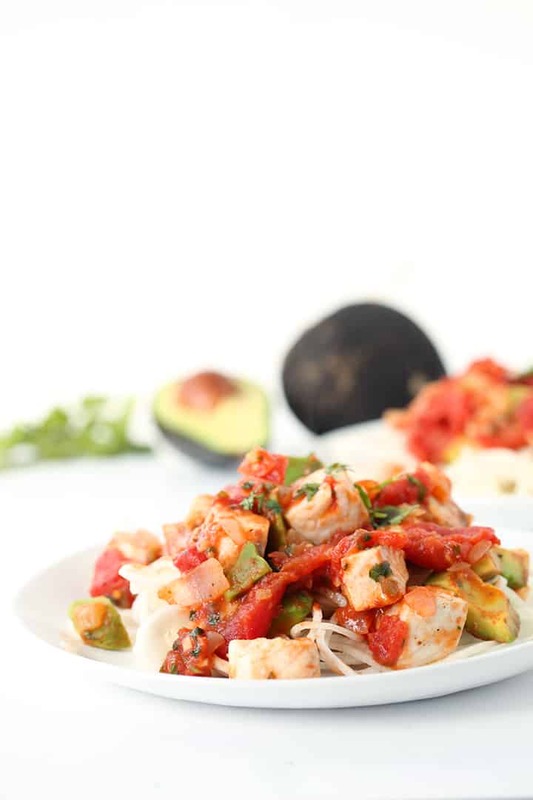 It was the end of the week and we hadn’t made fish tacos, so I wanted to make a seafood pasta. 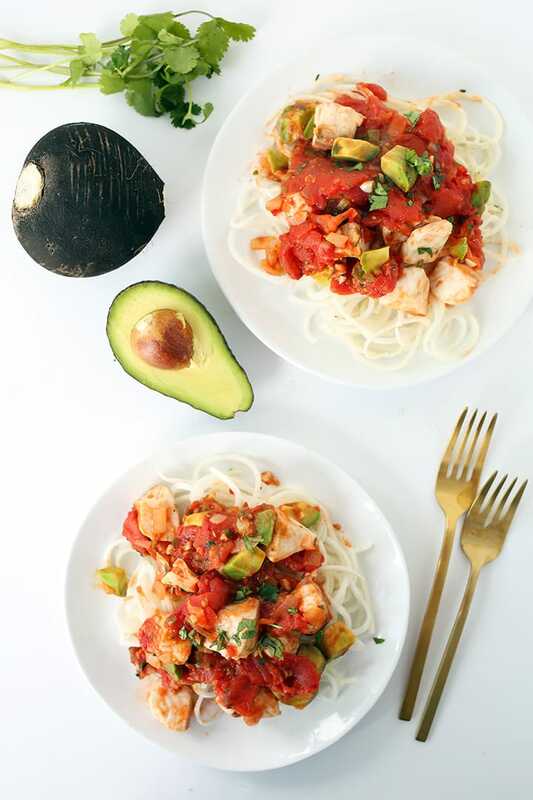 Somehow, I got distracted (as always) and spotted the cilantro, avocado and jalapeño and wanted to put a twist on a simple tomato seafood spaghetti. 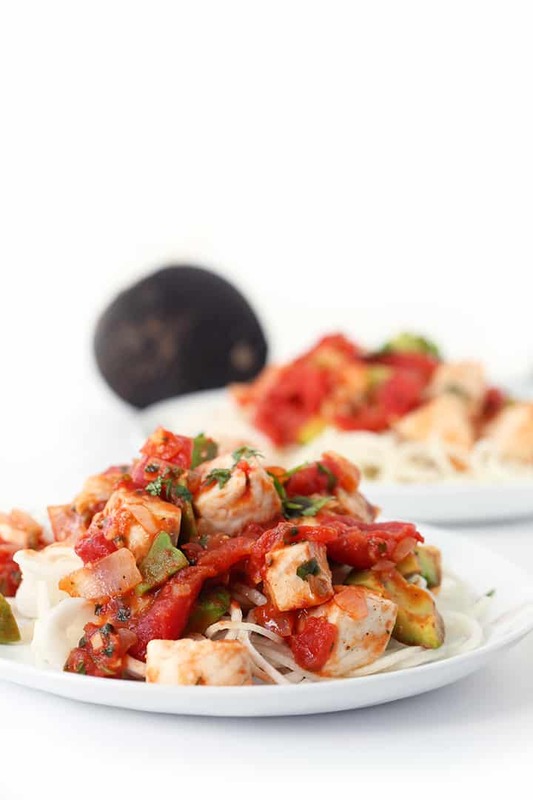 Thus, here we are, with this fragrant bowl of tilapia spaghetti – with black radish spaghetti. What I love most about this dish is the chunks of tilapia. 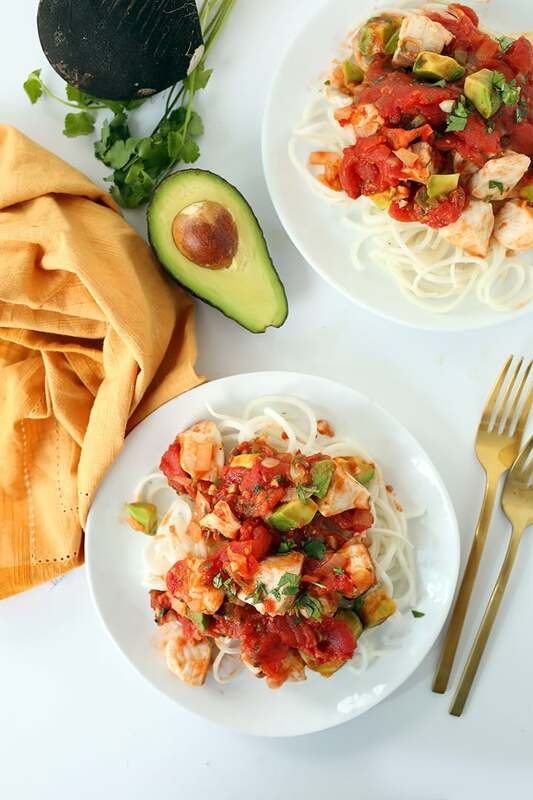 Each chunk absorbs the flavors as it simmers in the tomato sauce, so that when you bite into a piece, the soft white fleshed fish flakes in your mouth softly, with a velvety sumptuousness. Black radishes are easy to spiralize (shaped similarly to a turnip) – they have a black skin, but a white flesh – I guess they’re the Oreos of vegetables.Their taste is radish-like with a sliiight spicy kick, which makes them less bitter, in my opinion, to regular radishes. I can’t believe it’s taken me this long to make you a dish with black radish noodles, especially since I recently posted a picture on Instagram. I’ve added black radish to the Recipes page and hope to use them more often! Happy Oscars Sunday and I hope to see you on Snapchat! Remember – username inspiralized! Have you ever spiralized a black radish before? Place a large skillet over medium heat and add in half of the oil. Once oil heats, add in the onions, jalapenos and garlic. Let cook for 2-3 minutes or until onions are translucent. Then, add in the tomatoes and juices, crushing with your hands over the skillet. Then, season with salt and pepper and let cook for 5-7 minutes or until sauce thickens. Once sauce is almost done, add another large skillet over medium heat and add in the rest of the olive oil. Once heated, add in the radish noodles and season with salt and pepper. Cover and cook, uncovering occasionally to toss, for 5-7 minutes or until cooked to al dente (or your preference). 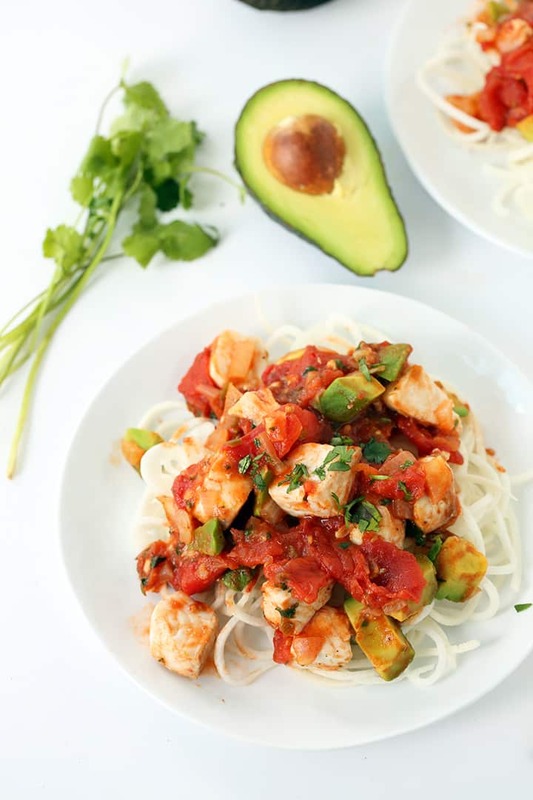 Once you add the radish noodles to the skillet, stir in the avocado and cilantro into the tomato sauce and then add in the tilapia, nestling it into the sauce. Let cook, covered, for 3-5 minutes or until opaque and cooked through. Divide the radish noodles into bowls and top with tomato sauce. Serve immediately. What a crazy exciting week for you Ali! Congratulations, all of your hard work is paying off. And I have NEVER heard of black radishes, I'll have to look for them today, when I'm out shopping to spirilize this week! Can't wait for the cookbook! Thank you so much for the enthusiasm, Pam!! This sounds really tasty! Will have to search for black radishes. After enjoying some of your recipes from the website, I've ordered your new book. Looking forward to testing it out. Congrats on the magazine mention! Yay, thank you so much Stacey!!!! Soooo excited..had my email to say my book is on the way! I have never heard of black radish! Have they another name that they are known as in the UK? For those of us who can't find black radishes - what's the best sub for this dish? 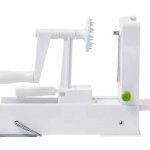 I'd assume regular radishes, but those little babies sound like a pain to spiralize!? As posted below...I used daikon radish...turned out fabulous. Made this last night for myself and my 12 & 13 year old daughters. They LOVED it! No black radishes to be found so I used daikon instead...delish! I make someshing spiralized at least 2x a week. My 14 year old is constantly teasing me about "veggie noodles" but she loves every dish! Thanks for the inspiration Ali!